Illinois State University’s College of Fine Arts will present the following events during November 2016. Please note that the dates and times of events are subject to change and this list may not include all events offered. All events at the College of Fine Arts can be found on the university’s calendar. Please check the university calendar to confirm all event details. To confirm scheduling and to purchase tickets, contact the Center for the Performing Arts box office at (309) 438-2535. 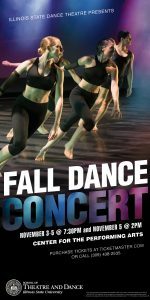 2016 Fall Dance Concert poster. Please contact the Center for the Performing Arts box office at (309) 438-2535 to purchase tickets. 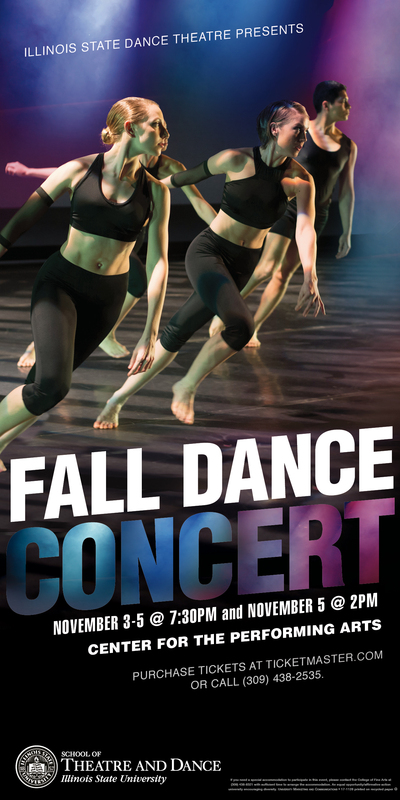 November 3–5 at 7:30 p.m.
November 5 at 2 p.m.